Festa Winter Palace 5* is unique in furnishing style and architecture. The hotel offers great opportunities for a winter ski vacation, high quality service and fine luxurious interior in wood and marble. 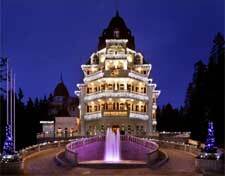 The hotel combines a winter mountain holiday with first class service and refined luxury. The deluxe 5 star hotel is just 20 m away from ski run �Cherveno zname� and the high speed squad �Sitniakovo Express� and 100 m away from the Gondola lift. Nested in the marvelous pine woods Festa Borovets is the pearl in the resort. Unique in style and furniture, the hotel combines mountain holiday with first class service and exquisite luxury. The hotel offers 24 double rooms, 19 deluxe rooms, 11 junior suits and 12 luxury suites. The hotel is with central heating, the bathrooms are large and comfortable with bathtubs or showers. The rooms� balconies reveal stunning views to the slopes. For the most exigent admires of the gastronomy temptations the GOURMET RESTAURANT is available. You will be impressed by the distinguished atmosphere and hospitality of the interior. Enjoy fine European cuisine specialties in combination with high quality wines and first class spirits.